Offering size options of 22m, 25mm, 28mm and 30mm standard, the DH Series can be customized up to 40mm. Being both vandal and splash resistant, this panel mount switch is heavy-duty and rugged in construction. The DH Series is available as momentary or latching in both SPST and DPST, normally open and normally closed. Flush actuator styles offer non-illuminated, bi-color ring or dot illumination. Mushroom style actuators are available in red anodized aluminum in both dot illuminated or non-illuminated. Illumination color choices are red, yellow, green, blue, white and orange. LED voltage choices range from 6V to 220V. 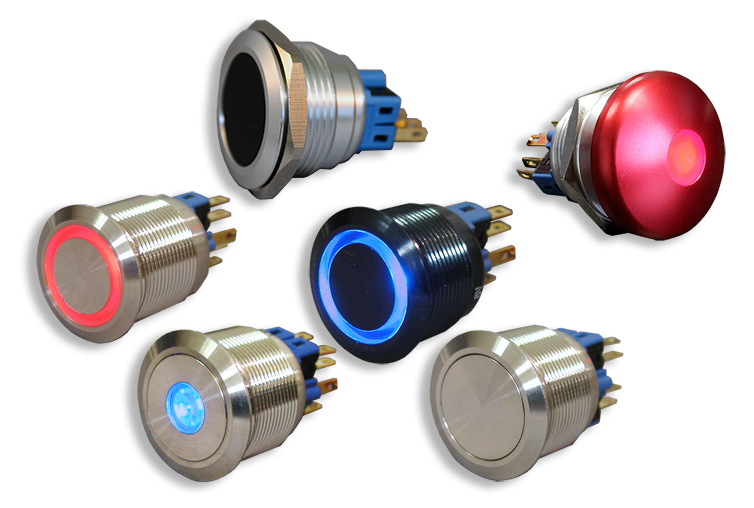 The DH Series latching push button switch is also available with UV protection to resist fading. Available for the 22mm and 25mm versions, wall plates are available in brushed aluminum and yellow anodized brushed aluminum in three different sizes along with aluminum switch housing in up to 5 positions, with and without mounting flanges.